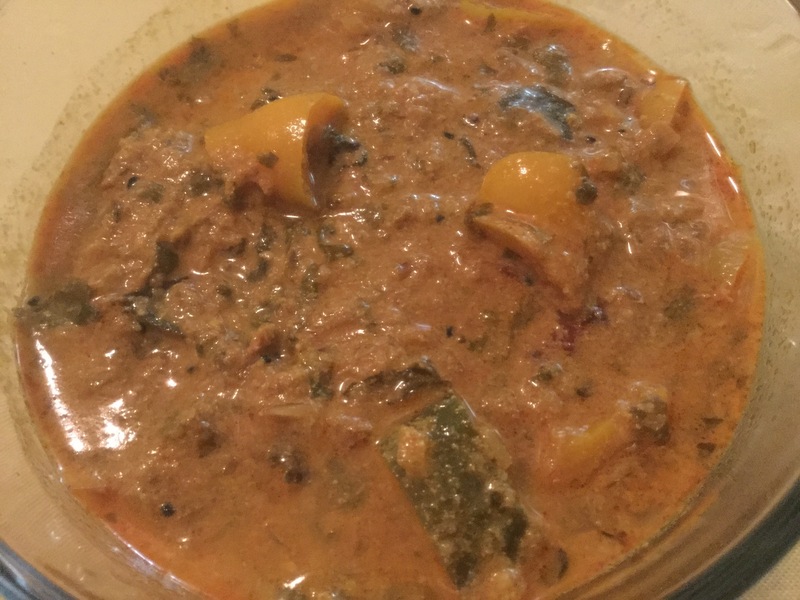 I wanted to prepare a gravy dish that would go well with roti/chapati and even with rice/biryani as a side dish as I had some left over chicken biryani. I searched through my veggie storage in the refrigerator and found two medium – big sized bell peppers. 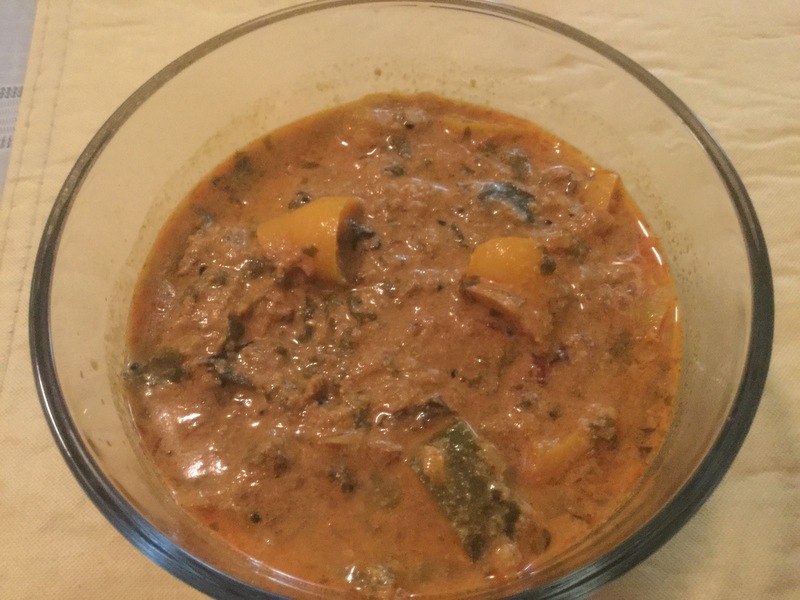 Recently I had tried and posted Eggplant Salan recipe. I decided to follow same only replacing the eggplant with bell peppers and reducing a step or two. It turned out to be yum and my purpose was also met. In a pan, dry roast, peanut powder, sesame seeds and coconut powder. Once cooled down, grind into fine paste using water as required. Keep aside. In a pan heat the oil. Once hot, add the mustard seeds, cumin seeds, methi, kalonji, red chillies and curry leaves. Once they crackle, add the onion and green chillies and sprinkle little salt as this aids in cooking for the onion. Once the onion become transparent, add the ginger garlic paste and sauté till the rawness of the paste is lost. Now add the spice powders – turmeric powder, red chili powder, cumin powder, coriander powder and mix well. Now add the ground peanut-sesame-coconut paste and little water. Cover and cook till the oil separates. Then add the yoghurt and salt as per taste and give it a good mix. Now add the chopped, mint and coriander leaves and also the cubed bell peppers. Cover and cook till the bell peppers are well cooked and soft but not mushy. Serve hot with roti/chapati or biryani. Enjoy! In Goa, the place in India where I belong, rather than chapati or roti, Goans prefer eating pao (bread buns or rolls) with chicken gravy. Though now a days, many have moved to adjusting with roti or chapati due to the rising fare of pao in bakeries. So out of habit, whenever I decide to prepare any spicy chicken curry, we plan to buy bread loaf or rolls. If none is available we settle down for slice bread which is always there at home. Slice bread is like a savior in need of calamity ;). This once we had bought multigrain baguette. Being quite long enough, much of it had left over. How to finish it off was a question I was thinking of answering quickly.I usually have shredded mozzarella cheese readily available in my freezer. So decided to make Cheese garlic bread taking garlic bread recipe from madhura’s recipe as the base. Cut the baguette into slices or if you are using bread slices, cut them into triangle shape. In a bowl, mix all rest of the ingredients except bread. Instead of minced garlic cloves, you can even add ginger garlic paste. Take a slice of bread and apply the butter mix. I prefer applying on both the sides of the slice. Arrange the buttered slices on an oven tray. Sprinkle the shredded cheese on each of the slice. Bake these slices in an oven pre-heated at 400 F for around 5 minutes.